At lunch today I hiked in from the east side of Kishwaukee River Forest Preserve (parked in front, but not blocking, the locked gate). From here, I hiked down the hill, turned left and followed the road to its end. 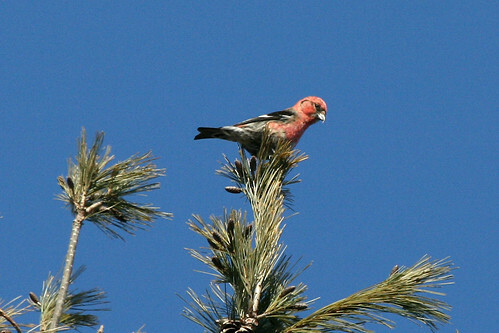 There are a lot of pines here and that is where both White-winged and Red Crossbills were hanging out. Also, many Pine Siskins, Red-breasted Nuthatches, Black-capped Chickadees, and a Tufted Titmouse that followed me around. 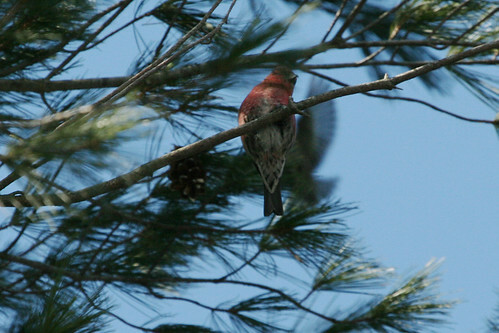 Dan Williams has found White-winged Crossbills at 10:15 this morning in Greenwood Cemetery in Rockford. That’s on the northeast corner of the intersection of North Main St. and Auburn St. The birds were in Hemlocks surrounding a small traffic circle just north of the Stone chapel. In the circle there is a headstone with the name Bartlett on it. He also saw Siskins and Red-breasted Nuthatches in the cemetery. There is a Spotted Towhee at a residence in Ogle County. The bird has been hanging out in a barn for over a week now and possibly all winter. Janet & Darrell Friday, 815-234-5684. After Mike Baum reported on IBET last weekend that he saw both crossbills at Lowden Miller SF in Ogle Co., I drove there this morning and found a nice flock of 18-20 White-winged Crossbills in the large stand of White Pines at Parking area #1 around 9:30 a.m. I had to walk way back into the pines along the trail before I found them, but they were quite noisy as they fed on the cones. The trees have a lot of cones. I also counted 18 Red-breasted Nuthatches along the trail, but that number is conservative. I am certain that there were more. I then drove down to Parking area #4 to the stand of Red Pines (at least they look like Red Pines) and found at least 6, maybe 1 or 2 more, Red Crossbills. I also discovered Phil Schwab there. We were both so bundled up against the cold that we didn’t immediately recognize one another at a distance of 50 yards or so!! There was a small flock of Snow Buntings on Lowden Road about 1 mile N of Flagg Road. I did not see any falcons in the area of Flagg Road and Daysville Rd. On my way to work this morning, I saw a small but powerful falcon chasing a flock of starlings. It was a Merlin. Flew around harassing the starlings for a little while and then headed northwest up Kent Creek. This is very close to the spot where Barbara found one (in Page Park) on the Rockford CBC on December 20. If you are in the neighborhood, keep your eyes out for it. On Friday Jan 16 I saw several Bluebirds on the Pecatonica River bottoms. Flickers were still abundant and one Robin showed itself. Karen Lund reported a Prairie Falcon from the intersection of Daysville Rd and Flagg Rd., in Ogle Co., early on Sunday afternoon. I wonder if she meant Lowden Road? Not sure where Daysville might intersect with Flagg. I found 3 Trumpeter Swans (2A, 1i) at Carnation Park, on the Rock River about 8 blocks S of IL 64, this afternoon. There was a Northern Shrike on Naylor Road, along the S side of Nachusa Grasslands, about 3.0 miles W of Lowden Road in Lee County. The NCIOS field trip to Starved Rock SP and the IL Waterway Visitor Center in Utica had 8 hardy participants who braved the windy day and showed up for the trip. The gull flock is just beginning to reassemble there after all of the flooding and open water since December 27. The very cold temperatures over the past week has frozen all of the water above the dam. There were approximately 150 Herring Gulls. In the flock was an adult Thayer’s Gull that gave everyone excellent looks as it flew right over the deck of the visitor center and out over the lock. It was a life bird for several people. The only other gull species was Ring-billed, but just 1 bird. There were approximately 150 Common Mergansers, 1 Red-breasted Merganser, many Common Goldeneyes and a Redhead. There were 43 Bald Eagles around the lock and dam, and a couple of Rough-legged Hawks and a few kestrels along I-39 on the way back. The feeders at the Starved Rock Visitor Center had White-throated, White-crowned and Fox Sparrows, plus 5 Pine Siskins and 3 species of blackbirds.